HeatTech mats are primarily intended for installation underneath the tile floors which are common for such parts of the house as bathrooms, showers and kitchens. Since these areas are exposed to a lot of moisture (especially bathrooms and showers), a GFCI (Ground Fault Circuit Interrupter) is mandatory. 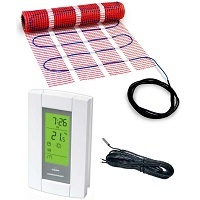 Honeywell thermostat included in this kit comes with a 5mA GFCI which provides the required level of protection and safety.